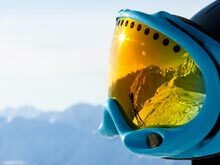 Exploding a few of the myths and misconceptions surrounding skiing. 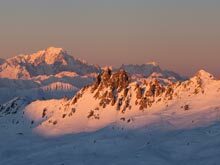 I am indebted to my good friend Rob Sewell, a private ski instructor from Courchevel for the title of this blog. Last year he recounted to me the story of how he had witnessed a lady careering out of control across an icy piste with her husband bellowing after her "dig it in Camilla, dig it in!" Assuming he meant the ski, poor old Camilla was being instructed to do the very thing that was guaranteed to increase her difficulties. It is one of the great myths of skiing that when you encounter ice you should try to dig your ski in. There is little chance that you are going to get any grip on ice and every chance that the ski is going to break away from underneath you. Moreover, even if you did succeed in getting the edge of the ski to bite, you'd then find that you'd go hurtling across the hill along that edge at increasing speed, rather than controlling your speed and direction. What you need to do on ice is to flatten your skis, soften your legs (flexing rather than bracing), accept that there is going to be some degree of skid and using leg rotation, gently manage that skid in the direction that you'd like to travel. The great ski guru and author John Shedden once said "there's only one weight in skiing, and that's W-A-I-T." Modern skis work by being put on their edge and being bent into reverse camber. You do this by pressing the ski through the arch of your foot with an extension of the leg. Trying to put your weight where it isn't will only result in you contorting your body and trying to lean over the ski will have you out of balance laterally. Any apparent leaning that we see in good skiers is simply the skier resisting the pull of gravity; it's not something that we set out to do consciously. Modern parabolic skis are skied in a totally different way to the old straight, narrow skis of yesteryear. Modern skis work on a combination of their egg-timer shape and the fact that they can be bent into reverse camber by a central application of pressure to effect a curve. Old skis required that the skier "unweight" the ski by a quick extension of the legs (known to all British instructors rather pejoratively as "pop and swivel") and then, when the skis started to turn downhill, the skier completed the turn with a rotation of the legs. This movement is a lot more vertical and rotary than the movements we use nowadays. Because there was so much rotation used in steering old skis, we could benefit greatly from an effect known as "elastic recoil." This is the effect seen when you twist something against itself: when you then release it, it will want to return to its original position. In old style skiing, keeping the shoulders pointing down the hill ensured that when the skier made their abrupt "pop" upwards, then the legs, which were pointing across the hill wanted to realign with the upper body thus aiding the skier in rotating the skis. We don't need to do this with modern skis and our more progressive movements. We can now allow our bodies to follow the skis. Again this misconception arises from handed down tales of skiing on old-style skis. The old narrow skis didn't offer as much flotation as modern skis and also had a tendency to "submarine" into deep snow. Modern skis being much wider under foot and turned up at the front will stay afloat in powder or other deep snow. As i pointed out before, the skis work optimally when the skier is balanced on the centre, so it makes sense to try to maintain a position where you are perpendicular to the skis. 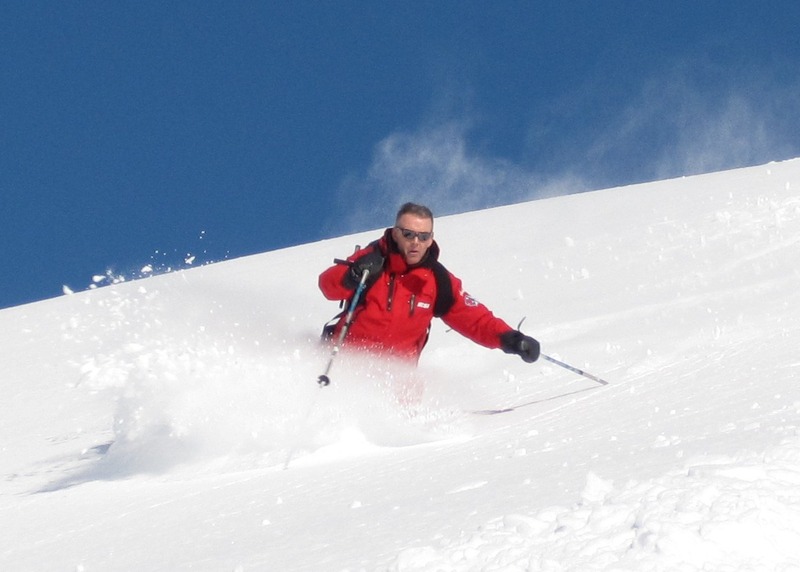 Stand in the centre of the skis and keep your feet under your hips. I would love some feedback on this article if anyone would like to leave a comment. Also, i'd be grateful if anyone could contribute some more myths that might need exploding or explaining. In conclusion i'd like to leave you with a little thought from my colleague Craig Conkie from BASS (British Alpine Ski School). 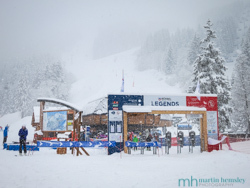 Last year when i was talking to Craig about how my clients were finding it difficult to cope in the end of season slush, Craig said " ah, i just tell them to lean back as far as you can go and use your arse as a rudder." BRILLIANT!